Using a new technique they call "in-air microfluidics," University of Twente scientists succeed in printing 3-D structures with living cells. This special technique enable the fast and 'on-the-fly' production of micro building blocks that are viable and can be used for repairing damaged tissue, for example. The work is presented in Science Advances. Microfluidics is all about manipulating tiny drops of fluid with sizes between a micrometer and a millimeter. Most often, chips with tiny fluidic channels, reactors and other components are used for this: lab-on-a-chip systems. Although these chips offer a broad range of possibilities, in producing emulsions for example—droplets carrying another substance – the speed at which droplets leave the chip is typically in the microliter per minute range. For clinical and industrial applications, this is not fast enough: filling a volume of a cubic centimeter would take about 1000 minutes or 17 hours. The technique that is presented now, does this in a couple of minutes. Can we reach these higher speeds by not manipulating the fluids in micro channels, but in air instead? This was one of the questions the researchers wanted to answer. And indeed it was possible, by using two 'jets' of fluid. From one jet, droplets are shot at the other jet. Creating the jets is relatively simple, and they move 100 to 1000 times faster than droplets from a microchip. Speed is not the only advantage. By choosing jets containing different types of fluids that react, the 'collision' results in new materials. Smart combinations of fluids will result in solid and printable building blocks in one single step. 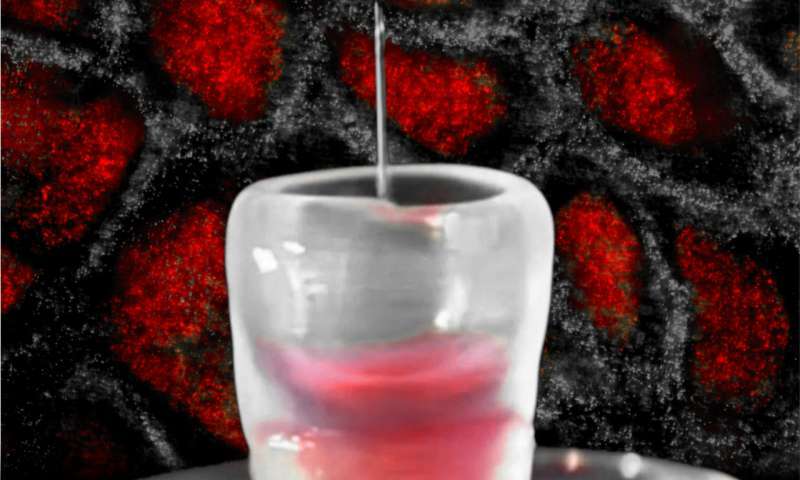 In this way, it is possible to capture a living cell inside printable material. The resulting bio building blocks are printed in a 3-D structure that looks like a sponge, filled with cells and fluid. These 3-D modular biomaterials have an internal structure that is quite similar to that of natural tissue. Many 3-D printing techniques are based on using heat or UV light: both would damage living cells. The new microfluidic approach is therefore a promising technique in tissue engineering, in which damaged tissue is repaired by using cultured cell material of the patient. 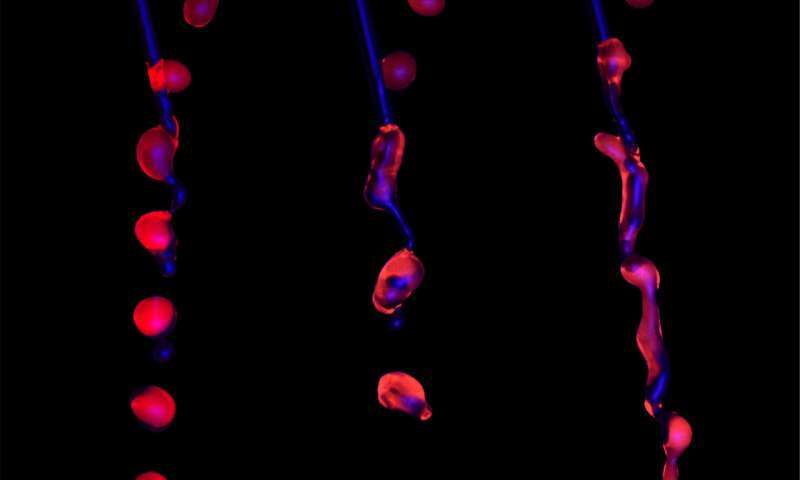 The research has been done by Tom Kamperman of the Developmental BioEngineering group of Prof Marcel Karperien, and by Claas Willem Visser of the Physics of Fluids group of Prof Detlef Lohse. Kamperman just recently finished his Ph.D. on this subject, Claas Willem Visser temporarily works as a scientist at Harvard University on a Rubicon grant. He will return to the University of Twente afterwards and become an assistant professor. Both scientists are involved in the new IamFluidics spinoff, in which in-air microfluidics is used to create functional particles and materials. The paper, "In-air microfluidics enables rapid fabrication of emulsion, suspension and 3-D modular (bio)materials," was published online on 31 January in Science Advances.